If homing pigeons are not “in racing pigeon school,” then they are in the wild – even in a pigeon loft. If homing pigeons do not continually interact with fanciers on a daily basis (at a minimum), then they are growing up in a “natural” or “wild” psychological environment. As with all animals, pigeons are born with genetic codes that control psychological predispositions. Most pigeons’ psychological predispositions are not particularly compatible with the domesticated environments found in typical homing pigeon lofts. The psychological predispositions of all pigeons, including domesticated homing pigeons, are naturally bent towards “the wild.” Homing pigeons are “naturally” suspicious, timid and afraid of anything other than other homing pigeons. People are strangers that should be naturally feared. It takes a great deal of time, dedication, patience, and positive reinforcement by knowledgeable and caring fanciers for pigeons to over come these “natural” genetic tendencies and psychological predispositions. Every day after young birds are hatched, and certainly after they open their eyes, they should experience some type of “racing pigeon school.” Without experiencing the phenomenon of human interaction through a formal pigeon school, young birds will develop and mature solely in response to their natural genetic tendencies and natural psychological predispositions. Domesticating, teaching and training homing pigeons to play the racing pigeon game is a process that is in direct contradiction to their “natural” tendencies and predispositions. 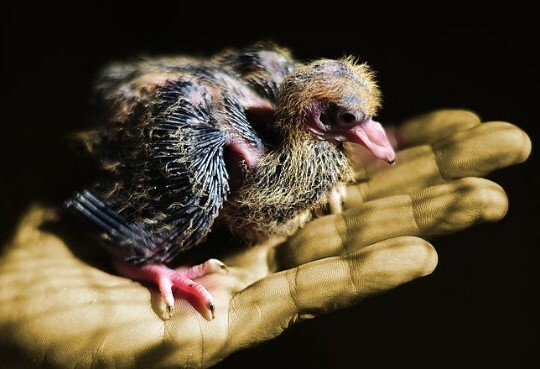 Pigeons do not hatch automatically or naturally knowing anything at all about the socially constructed racing pigeon game as it is practiced by fanciers around the world. Pigeon are hatched with natural tendencies for self preservation only. These tendencies include the basic components of survival, i.e., eating, drinking, finding shelter, using fear and procreating the species. Fear is a very important part of the successful survival of wild animals and domesticated animals. Successfully reacting to fear is the epitome of success for most pigeons. Fear is a survival tool. For wild pigeons, exhibiting fear is the primary measure of success. For champion racing pigeons, exhibiting trust is the primary measure of success. One of the primary goals of “racing pigeon school” is to overcome and neutralize the “natural” fear that occurs in the survival mentality of both wild and domesticated pigeons. Pigeons must be taught and trained to trust their fanciers. Consequently, a primary goal of “pigeon school” is to reduce and eliminate fear and to replace natural fear with learned trust. What is “racing pigeon school?” Racing Pigeon school is a daily process during which fanciers teach and train their pigeons to play the racing pigeon game at the top of the race sheet. Racing Pigeon school should begin immediately after hatching. Hatchlings should be gently handled. Gently handling hatchlings will allow them to smell and touch their fanciers. They should also hear their fanciers’ voices. When their parents are fed in their nest boxes, fanciers should signal feeding times through voice commands or some other type of artificial instrument like a whistle. In the rural west, chuck wagon cooks or ranch cooks would use a ringing or clanging signal to communicate to the ranch hands that it was time to eat. When the dinner or supper signal rang, cowhands briskly headed for the dining table. It is the same with racing pigeons. Pigeons learn “to come” during the feeding process. The natural tendency of pigeons is to move away from fanciers as they encounter them inside or outside the loft. Using feed as an enticement, pigeons can be taught to move toward their fanciers because they trust them rather than move away because of fear. Racing Pigeon school varies from fancier to fancier. Racing Pigeon school varies based upon the likes and dislikes of each and every fancier. That is one of the great beauties and enticements of the pigeon racing sport. All fanciers can develop their own management system based upon the social circumstances in which they find themselves, i.e., living alone, family requirements, money constraints, time constraints, work requirements, building codes, city regulations, neighborhood covenants, etc. Regardless of the pigeon school that a fancier develops and practices, pigeons should experience pigeon school every day of their lives. Animals and pigeons learn optimally through daily repetition. Repeating the same routine day after day will constantly reinforce the basic components of a fancier’s pigeon school. Consistency and repetition develop trust. Pigeons will learn to trust if their expectations are consistently met day after day. Regrettably, many fanciers will try to teach or train their pigeons on an inconsistent basis – only during specific critical periods. Many fanciers will ignore their youngsters until they encounter the following critical periods: (1) banding or ringing; (2) weaning; and (3) training just prior to the beginning of the young bird race series if the young birds are trained at all. There are those fanciers who state that they use the races to train their young birds how to return home and how to play the game. One of the purposes of today’s blog is to suggest that a more proactive and thoughtful “racing pigeon school” during which young birds learn the fundamentals of a sophisticated loft management system each and every day of their lives is a far superior teaching method than waiting to domesticate or teach young birds anything until they reach one or two critical periods during the first year of their lives. Many fanciers postpone education and training because they drastically underestimate the true intelligence of their pigeons. These fanciers do not see a danger or disadvantage in waiting to train their young birds until some future point in time. However, good homing pigeons are incredibly smart birds. They understand and absorb far more information than many fancier realize. One negative act can undue weeks or months of positive training. Why? Again, because pigeons are wild creatures by nature. They expect to be scared. Consequently, when they are frightened, their natural fears are validated and reinforced. Undoing negative acts by retraining pigeons to trust takes a tremendous amount of time and patience. For those fanciers who have bred winter youngsters, racing pigeon school is now in session. Please do not wait until your young birds are weaned to first handle them; to teach them to come when called; to teach them to eat on their own; to let them sense you through smell and touch as well as sight and sound. By the time your young birds are weaned, they should already know how to eat on their own. They should already know how to come when called; although they might not respond correctly at each and every feeding because they are babies – not adults. Weanlings should know who you are. They should have experienced your management and care through as many of their senses as possible: sight, sound, touch and smell. They are wonderful intelligent birds that should be taught and trained through a formal pigeon school that you have developed based upon best management practices in order to neutralize their natural tendencies that fostered by fear.